Takeaway: By following these basic guidelines, industrial cleaners can work safely at any height. Safety continues to be a major concern in the industrial cleaning field around the country. Hydroblasting workers, a growing segment of this workforce, face a multitude of hazards on the job every day. With the pressure reaction of turning the water stream on and off, possible surges in the hose line, and crews working on raised platforms, fall protection is an important area of concern for employers and safety managers in charge of these employees. Safe work practices and ongoing training are crucial when protecting waterjetting workers from devastating falls. By knowing what equipment is needed on the job site, providing that equipment to the crew, and training them to use it properly, employers can help prevent injuries and deaths. The first step is to identify fall hazards and decide how to provide the best protection. Analyzing the work area may include reviewing blueprints before work begins, anticipating upcoming fall hazards as work progresses, looking at current hazards, and preparing a pre-planning checklist. There are many ways to protect your workers from falls, including using guardrail systems, safety net systems, and personal fall arrest systems (PFAS). 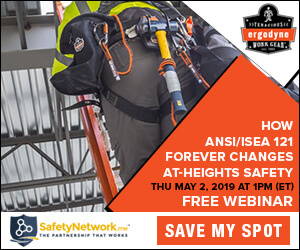 A – Anchorage: A secure point of attachment (structure) for the fall arrest system (find out How to Choose Your Fall Protection Anchorage). B – Body Support: Full body harnesses provide a connection point on the worker for the personal fall arrest system. C – Connectors: Devices used to connect the worker’s full body harness to the anchorage system (shock absorbing lanyard, self-retracting lifeline, etc.). Self-retracting lifelines (SRLs) keep workers safe at any height. Most SRLs stop falls within 24”. Crew members don’t have to calculate the fall distance when using an SRL, as opposed to a lanyard. D – Descent/Rescue: Rescue and retrieval of a fallen worker is a required component of any fall protection program. Individually, these components won’t provide protection from a fall. However, when they’re used properly and in conjunction with each other, they form a PFAS that’s crucial for safety on the job site. Choosing this equipment should always be in accordance with the jobs performed, the job conditions, and the individual worker. Crew members who are exposed to a fall must also be trained by a competent person on the correct procedures for set-up of the fall protection systems to be used, the use and operation of the equipment, their role, the limitations of the equipment, and proper handling and storage. By implementing safety procedures for crews, employers can help everyone stay injury-free. Using equipment past its useful life is a potentially deadly mistake. Fall protection equipment must be inspected regularly and taken out of service if it has been involved in a fall or shows signs of wear (learn How to Inspect Your Fall Harness When Working Alone). Wear can be caused by daily use or exposure to heat and chemicals. A few signs a worker should look for before using their equipment are fraying, cuts, and deformed metal hardware. When employers begin to select fall protection equipment, there are features to look for that may result in higher compliance. Choosing a harness with an ergonomic design and leg and shoulder padding relieves discomfort, leading to higher worker acceptance. For example, if a harness isn’t comfortable, workers may take steps to make it more comfortable, like loosening the straps too much. An improper fit, even if it's comfortable, just doesn’t offer the same level of safety. Maintaining a résumé of safety continues to be critical for industrial cleaning companies. Managers and safety supervisors can protect workers and increase morale by carefully selecting the fall equipment that everyone uses. At what height do falls become deadly? Who should be responsible for rescuing fallen workers? What kind of training do loading dock workers need? How often should I inspect a loading dock? How is wind chill calculated? Why should rubber insulating gloves be tested? Why is testing with a NAIL4PET accredited lab important? What kind of face protection do I need when using a chainsaw? What is the permissible exposure limit (PEL) for silica? What is silica and why is it hazardous? What is 'Table 1' and why is it so important? Video Q&A - What is a safety policy? What kind of fire extinguisher is best for your work site? How do I choose the right respirator and mask for working with silica? Can I wear fall protection equipment over my rainwear or winter gear? When do I need a cage ladder? What types of gloves protect your hands from hazardous chemicals? How come I still got hurt while wearing flame-resistant clothing? What dangers do workers face when working outside in the winter? How do I win over my most reluctant employees? What kinds of jobs should use disposable safety gloves? Is it true that safety shouldn't be a top priority? When are employers allowed to conduct drug and alcohol tests on their employees? How can I get employees more involved in the risk assessment plan? What are some of the indirect costs of accidents? What is the best way to store rubber safety gloves? How much voltage protection is needed for safety gloves used in electrical work? When do workers have the right to refuse to work? What is the most overlooked item when designing Lockout/Tagout (LOTO) procedures? What are some of the misconceptions about heat stress and what should we do to address them? What tools should I tether when working at heights? What types of gas should I watch out for when working in a confined space? How do you create a culture of safety in your workplace? What is the difference between industrial safety and industrial hygiene? What is the best kind of gas detector to use in confined spaces? Is it important to get PPE assessments by trained professionals? What kind of respirator cartridge should I use? What are the safety benefits of a whistleblower program? What type of safety record-keeping and recording should we be doing? What makes a hi-vis safety vest ANSI compliant? Why is it important to have air sampling done to determine my PELs? What’s the difference between a bump test, a calibration check, and a full calibration? Is there any legislation regulating lone worker safety I should know about before hiring? What kind of fire extinguisher and accessories should be kept on hand on a factory floor? Video Q&A - What's your safety network like? Video Q&A - What are the 3 levels of safety? Does body weight affect falls differently? What ages are most affected by falls?